Gatwick and Heathrow are to spend millions of pounds on anti-drone technology following the disruption at the Sussex airport before Christmas. 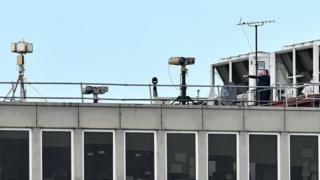 The equipment, which can detect and jam communications between a drone and its operator, was deployed by the RAF on a roof at Gatwick last month. About 1,000 flights were cancelled over three days due to drone sightings. Gatwick said it had spent £5m to prevent future attacks, and Heathrow confirmed it would be buying systems. More than 140,000 passengers at Gatwick were affected during 36 hours of chaos between 19 and 21 December. The military was brought in by the government and was only stood down on Wednesday this week. The Ministry of Defence said personnel from the Royal Air Force Regiment were involved in the deployment. Last year it was reported that the MoD had ordered the Drone Dome system developed by Israeli company Rafael. The system has a range of several miles and uses four radars to give 360-degree detection to identify and track drones. However, it is understood the MoD is still waiting to receive the system and alternative technology was in use at Gatwick. Gatwick and Heathrow have not disclosed the equipment they plan to use in future. A Gatwick spokeswoman confirmed the airport had invested in new anti-drone defences after the disruption. A spokesman for Heathrow said: “The safety of our passengers and colleagues remains our top priority. Sussex Police, which is still investigating the disruption, says it was caused by “numerous instances of illegal drone activity”.